The one on the left is mine, the one in the right was one I found left on a seat on the way out. Yes, it’s the same film, but advertised to start at different times. 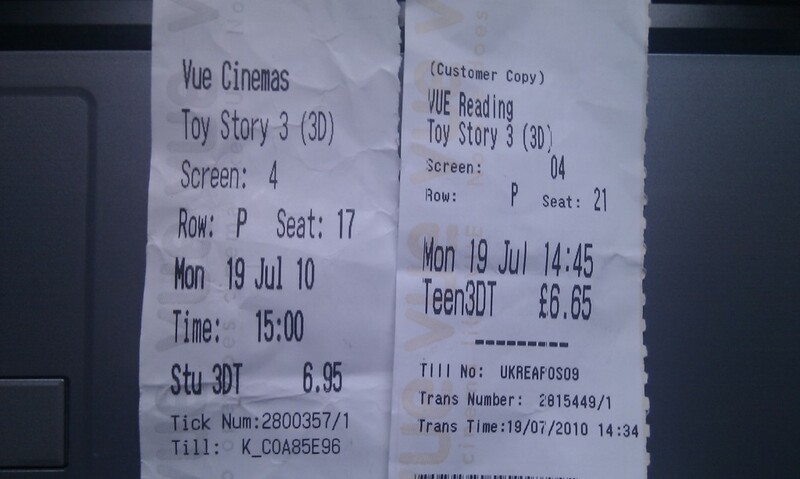 Despite having set seats in the cinema, I still like to turn up 10/15 minutes early, which I did. However, on getting into the screen , the adverts were already playing, which I found very strange. Come 3 o’clock, the trailers started (only a couple) and very quickly the film started (in this case the pixar short). It’s a good job I try and get there early. If I had been someone who tried to miss most of the adverts, I’d have ended up missing the start of the film. I’d purchased my ticket two weeks in advance (largely to make sure I got a good seat), so I can’t say I was impressed that Vue decided to change their screening times, closer to the time. As for the film itself? The Pixar short at the start was probably the least favourite of the ones I have seen. I found myself bored during it, rather than laughing. The film itself I enjoyed. It certainly pulled at the heart strings towards the end, but it was pretty fun all the way through with a number of laughs. Not sure I’d advise rushing out to see it, but it’s certainly worth trying to see whilst it’s still on at the cinema. As for the 3D effect, I didn’t find it distracting and nor did it give me a headache like Shrek 3 did. If you’re going to see the film at the cinema, I’d say it’s worth spending a little extra to see it in 3D.